Changes and cancellations are free of charge up to 4 weeks prior arrival. Cancellations and changes after 4 weeks prior arrival will get charged the full amount of the initial reservation. Children under the age of 18 are only allowed to stay when accompanied by adult supervisors. Destiny Student - Murano is located on a quiet street just off Leith Walk with the city centre within easy walking distance. This purpose-built student campus accommodation offers guests a central base in Edinburgh to relax and socialize at an affordable rate. 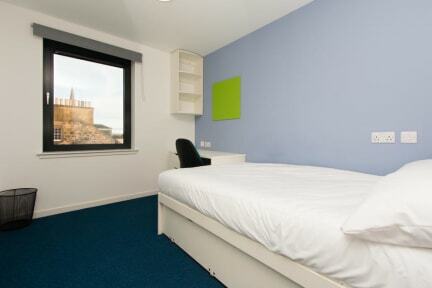 Destiny Student - Murano offers double en-suite rooms with shared kitchen and living areas. Private apartments are available for larger groups or families. 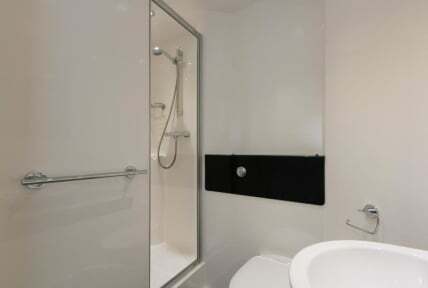 Studios with en-suite facilities, and private kitchen and living areas are also available. All rooms are en-suite with 120cm-wide, small double beds, fresh linen, access to kitchen facilities and living areas with a TV. Guests can make use of free WiFi access throughout the building, games room and a pay-as-you-go laundry facility. Simple key fob entry throughout the building. The reception at Murano is open 24 hours a day if you need to check-in late or book a walking tour, pub crawl or even a bus tour into the highlands as well. All of our rooms are set up with 3/4 double beds (semi double). Towels can be purchased. Linens are provided for free. We got some great dinner suggestions from hostel staff. Immaculately clean, and while not necessarily full of "personality", the hostel keeps things bright with splashes of color. Complaints about poor sound insulation are not misplaced, so be kind and close doors softly. However, it is set back from the road and seemed to have a pretty quiet crowd, even in August. The only sound I heard at night was a passing seagull. Competently outfitted kitchen, though limited dining space. Was pleasantly surprised with my room being more of a studio apartment. It was exactly what I needed while I was on a business / leisure trip in Edinburgh. Great facilities in a new building, in walking distance from all sites and good access to public transportation. The en suite bathrootms were really nice and six rooms shared a kitchen/lounge. There are free walking tours, but we didn't partake. Enjoyed my stay and would definitely stay there again! It was super loud! You can hear every door closing! I am usually not at all picky about rooms/ beds, but I have never felt so many springs in a mattress in my entire life. I thought the price was low but it wasn't low enough for that experience. Never again. The bed is very small fot two people. This was one of the worst places I've ever stayed. The staff were some of the most rude people I've ever encountered in my life. They came and knocked on our door at 10 and said as long as we checkout by noon we will only be charged 10 pounds yet when we went down to checkout they said we owe them 30 and wouldn't explain why they came to the room and told us otherwise. While checking out the manager also told us to not speak to the other customers and was not helpful at all.